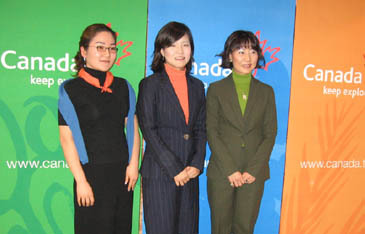 CTC Korea Managing Director Jessica Son (right) poses with CTC Marketing Coordinator Angela Youn (left) and CTC Media & PR Officer Anna Lee. The Canadian Tourism Commission(http://www.canada.travel) has recently announced the launch of a new visual identity for Canada's tourism brand in Korea. The CTC's new brand is a new combination of colors, typographies, pattern bar graphics and photographies. It spells out the essence of the brand-it's personality, look, voice, values and mission. Ms. Michele McKenzie, President and CEO of CTC, said that "this new visual identity is an evolution of Canada's tourism brand." He also said that "2007 is the year to bring Canada's global ID to life." With the slogan of 'Keep exploring', the new brand highlights Canada's image as a country of innovation and variety as opposed to its image as a 'beatiful land.' This new visual identity embraces the human and cultural aspects of Canada, such as fashion, music, shopping, food and art. The CTC's new official website, ' www.canada.travel', will advertise Canada's tourist attractions and will connect its travel bureaus, in order to help people get information about traveling to and around Canada. Canada, known as the world's third happiest country, is only its 11th ranked country as a tourist attraction. Thus the CTC's goal is to place Canada above 10th by 2010. With the help of the new brand, the CTC expects to promote Canada's young, vivid and innovative image. The CTC launched 'Keep Exploring' in 2005. This new brand, which promotes a more modern connotation of Canada, has been shared with more than 200,000 partners of CTC.